Notice: Undefined offset: 0 in template_preprocess_timelinr_view_timelinrfields() (line 87 of /var/www/web111/web/sites/default/modules/timelinr/timelinr.theme.inc). Notice: Undefined offset: 0 in template_preprocess_timelinr_view_timelinrfields() (line 88 of /var/www/web111/web/sites/default/modules/timelinr/timelinr.theme.inc). British Airways sells its in–house catering operations to Gate Gourmet. 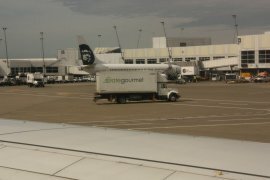 Under pressure to cut costs, Gate Gourmet, the world’s second biggest supplier of in–flight meals, reports first loss. Texas Pacific Group buys Gate Gourmet from Swissair. Union negotiations begin with Gate Gourmet over changing working practices. 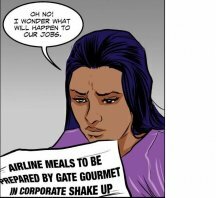 Virgin Atlantic cancels contract with Gate Gourmet. 10 August: Workers returning from their tea break find agency staff working on the production line. About 200 workers assemble in the canteen where they are joined by shop stewards. Management warns them twice by megaphone that if they do not resume work immediately they will be sacked. They are held in the canteen for about seven hours and then a lockout is imposed by Gate Gourmet. British Airways (BA) baggage handlers, bus drivers and ground staff stage solidarity strike action, paralysing flights for 48 hours. 11 August: 300 Gate Gourmet workers reporting for duty are asked to sign a new contract with worse pay and conditions. 12 August: Conciliation service ACAS holds talks between Gate Gourmet and Transport and General Workers Union (TGWU). 12 August: BA staff return to work as their union TGWU declares their secondary strike action is illegal. 26 August: TGWU District Officer Oliver Richardson announces that an agreement has been reached with Gate Gourmet. This offers: reinstatement for some workers (on new terms and conditions), voluntary redundancies for some and compulsory redundancies for others who will be offered compensation..
9 September: In the fifth week of the dispute, the TGWU issues a press statement confirming it has reached an agreement with Gate Gourmet concerning the selection criteria for redundancy . 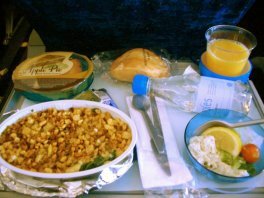 20 October: Gate Gourmet announces on its website that a new commercial agreement with British Airways has been signed. 9 November: Union solicitors file the Employment Tribunal cases for the 701 workers who have refused to sign the Compromise Agreement. 4 December: Some 500 locked-out Gate Gourmet workers and their supporters march through Southall to demand that the TGWU makes their dispute official and takes action to reinstate the sacked workers. 13 December: Gate Gourmet announces on its website that a total of 193 Gate Gourmet workers have so far signed the Compromise Agreement. 15 December: British Airways (BA) sacks Mark Fisher, one of the three TGWU shop stewards disciplined for organising an unofficial strike at Heathrow Airport on August 11th and 12th in support of the Gate Gourmet workers. The other two face disciplinary action and penalties. 5 January: British Airways (BA) sacks a second shop steward who had been charged with organising unofficial secondary strike action at Heathrow on August 11th–12th 2005. 25 January: The TGWU hardship fund for Gate Gourmet workers is closed and the last payment is made to the sacked workers still pressing for reinstatement. 08 April: Locked-out Gate Gourmet workers stopped from picketing the Gate Gourmet plant by the Heathrow Airport police and British Airports Authority Airport Duty Manager. The picket is no longer considered a recognised TGWU picket. 20 April: Gate Gourmet announces improved staff productivity, declining sickness rates and a reduction in the amount of overtime required. 18 September: The Guardian reports that two of the former shop stewards who led the solidarity action in August 2005 are to receive payoffs from the TGWU amounting to £600,000. 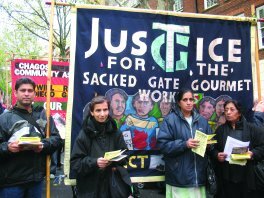 13 December: The Employment Tribunal at Reading in the case of “Abbas et al vs Gate Gourmet London Ltd” ruled that the assembling in the canteen on August 10, 2005 was unlawful unofficial action. March: On the brink of bankruptcy, Gate Gourmet is bought by 40 institutional investors including Merrill Lynch. 18 May: Reading Employment Tribunal hears the claims for unfair dismissal of 37 workers against Gate Gourmet. 12 June: The Employment Tribunal dismisses all but four of the 37 claims for unfair dismissal by sacked Gate Gourmet workers. 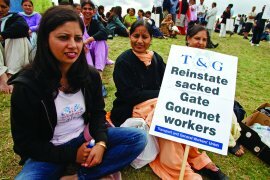 6 November: Gate Gourmet admits that it wrongfully dismissed eight workers who had all been off work sick, or on holiday or on compassionate leave on August 10 2005. 15 April: The Employment Tribunal rules that six of the remaining claimants were unfairly dismissed, among them S Dhillon, the union convenor at time of the dispute. It also found that two other shop stewards S Sandhu and H Singh were fairly dismissed because they had participated in unofficial industrial action. 2009: 56 sacked workers continue to reject the compulsory redundancy offer. Since TGWU (now UNITE) withdrew, only Newsline (part of the Workers Revolutionary Party) continues to support them. This provides detaild background to Grunwick and Gate Gourmet disputttttttt and traces the events leading up to action by the workforce in Agust 2005. It then traces the subsequent development of the dispute, and the actions of the key players – the trade union (TGWU) the company, and the workers. The time line takes us up to 2009 and to date (2013) there has been no resolution of this dispute for the women who refused the offer of compulsory redundancy and compensation and are still seeking redress for their grievances. This information is based on personal testimonies of gate Gourmet workers as well as media reports and other secondary sources.